Since there is a lot of interest in Mars at the moment, we should turn to the many innovative users of Google Earth for help. 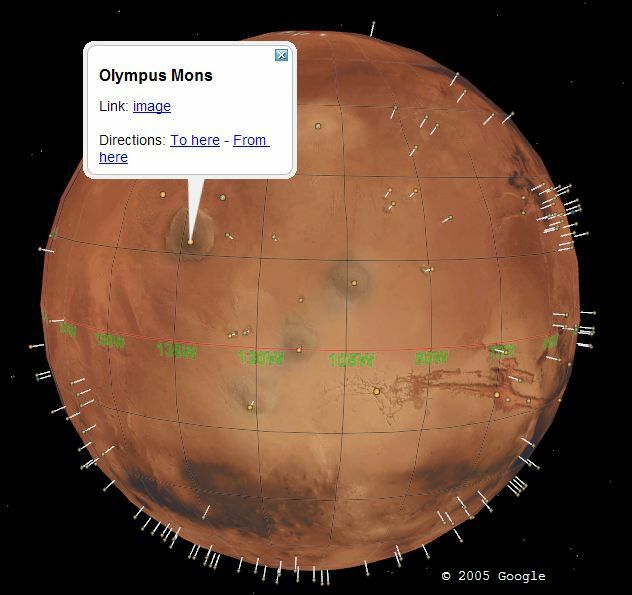 So, let's look at Mars in Google Earth right now! Last summer, someone called 'rottenapple' at the Google Earth Community (GEC) announced a Mars overlay with placemarks for Google Earth. You can load his Mars map with labels (v1.1) (4.5 Mbytes) and look at Mars now. Included is a high-resolution satellite photo of the entire surface of mars. In addition, are many placemarks showing the significant landmarks on Mars. Note: you may want to turn off "Atmosphere" in GE's "Tools->Options" menu choice. When Google re-releases their Mars database for Google Earth (see this) it will have even more data. Instead, you will have a 3D terrain model of Mars (just like we have now for the Earth). And, there will be layers for the various types of information available about Mars. Also, I presume users will add their own placemarks to make viewing it even more informative. With Mars coming soon, it can't be long before Google releases the Moon in 3D for GE. And some still doubt Google is tryin' to take over the world... hey... that was in the past. Google now is heading to take over the solar system - by now. Great tool for the classroom!